Did she say bacon...save me a slice! I love Paris Breakfast its as fun as a Laduree box...you never know what sweet treat you'll get when you open her posts!!! Kudos to her fabulous last meal too!! Thank you for letting us get to know her more!! Great to see the face behind the blog Anne. 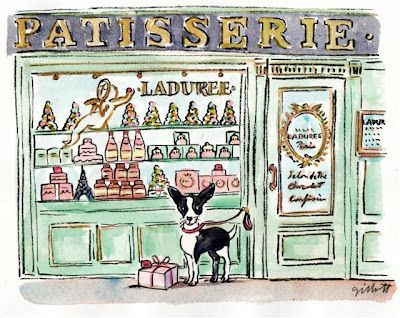 Her Laduree watercolour is so lovely. Huge fan of Carol's! She another great talent... like you! It is wonderful to get to know the artist, thanks for the great interview. 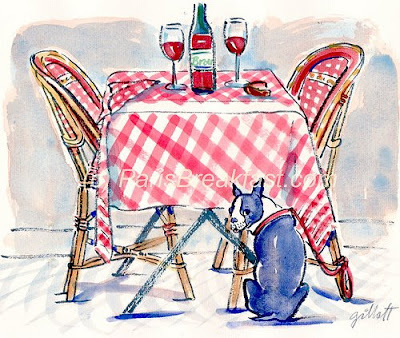 I love the Boston bulldogs in her paintings -- so cute. I'll be sure to check out her shop. Anne, I loved the interview on Carol. Her illustrations are lovely and fun! Great interview. I love Carol's work & her spirit! That was a great interview Anne! I love that she wears the authentic black and white stripe shirt which looks oh-so-French! Her work is great! You both are amazing artists! Where it not for Carol's encouragement, I would have stopped my blog years ago, nipped it right in the bud. She's one of the most generous people I have ever met, but being a great artist is what we all can see on her daily blogs. She is truly unique! That was fun! I am the proud owner of 6 of Carol's watercolors. They bring much joy and beauty to this old house. Nice to see you Carol..You are a lot of fun and very lovely! Love you blog Carol, you are a lot of fun and so lovely! Carol's fabulous--you did a good job of drawing out her joie de vivre. Charming! I love your art as well! Carol is so much fun. Loved her blog before my first trip to Paris. After the trip even more. 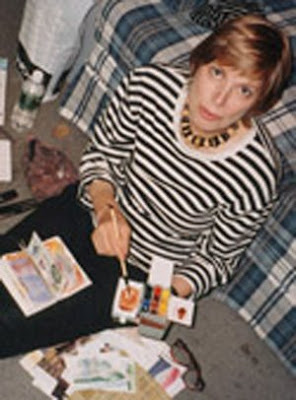 Own one of her watercolors. Made a second trip a year later. Realized she captures the sensibility and spirit of Paris. And the luscious photos of the pastries. Read her blog every day to get started ... and dream of my next trip to France. I am happy to be in such a good company ! They're so cute! She really captures the sweetness and quaintness of Paris! So fabulous...great interview, new to her work, thanks for the intro! Her paintings are so darling! A touch Madeline, no? What a great interview, and I'm so excited to discover her work. Thanks Anne! Precious works. Thank you for the tip!